With experience spanning all the way from Texas to the shores of South Carolina, Margaret Deal is a seasoned event pro who can build a menu, pair the perfect wine, wrangle a last-minute venue change and manage a two-ton load-in of tables, chairs and neon signs… all before lunch. 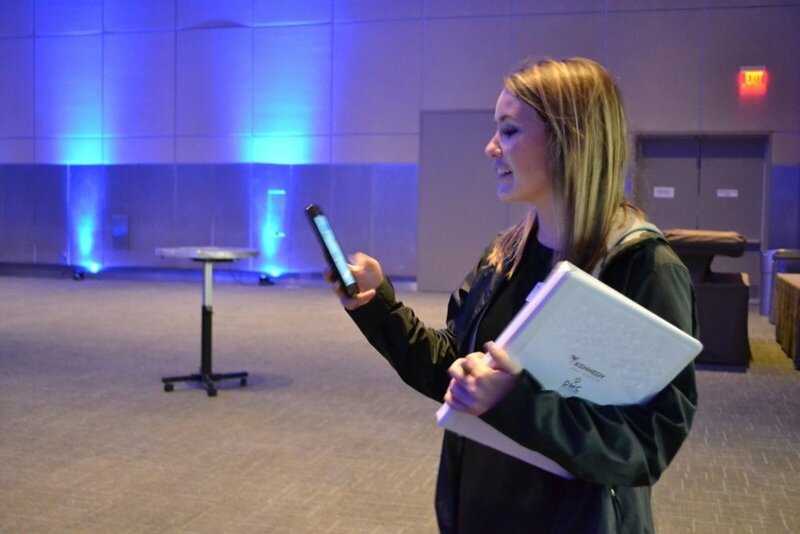 Not long ago, we took a camera behind the scenes with this multitasking dynamo at a multi-day, multi-tiered corporate event held at the convention center to show what it takes to be an Austin event producer who knocks it out of the park every time. 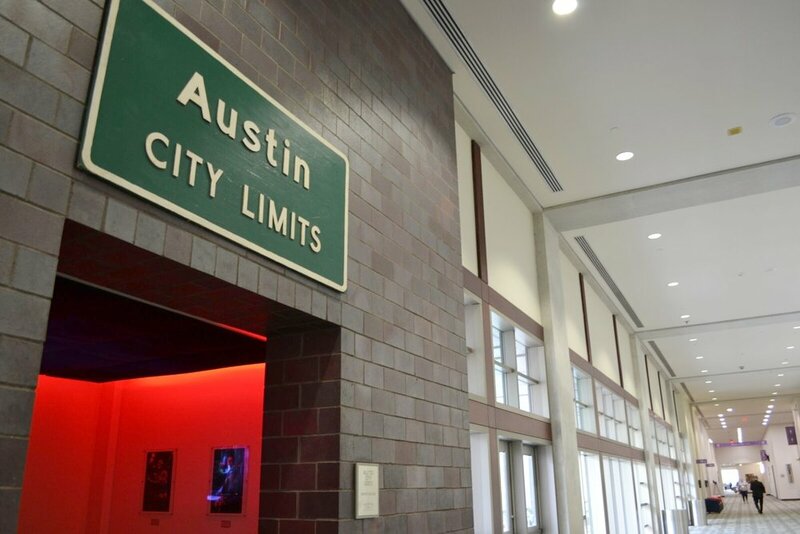 9:59 am – After a morning spent answering emails and calls at the office, it’s time to arrive at the venue — in today’s case, the Austin Convention Center, where a four-day corporate event is already in progress. It runs Monday through Thursday, has around 2,000 participants total — although most aren’t ever in the same place at once — and we’re now at the start of Day Two. 10:00 am – Right on time. As the conventioneers are letting their coffee kick in and getting deep into the day’s sessions, Margaret’s on the scene, ready to prep the venue for two separate setups happening in the afternoon: a smaller employee awards ceremony taking place on the north end of one floor of the convention center, and a larger cocktail reception taking place on the south end of another, leading into a farm-style event with full buffet and DJ later on in the day. 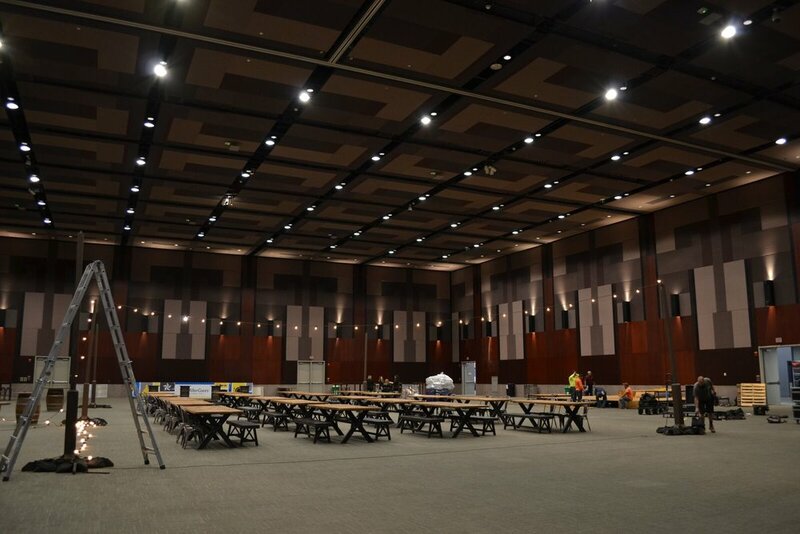 10:05 am – A walk-through of both spaces, plus the areas in between, ensures that the vendors are arriving on time, being granted access to where they need to be for a proper load-in, and that wayfinding signs are in the appropriate places to help guests find their way. 10:15 am – A quick check-in upstairs with Beth Danziger of Groove Labs, one of the day’s production partners. Among other services, the creative company pairs local musicians with corporate events in need of a live music component. Today’s event has two local musicians on deck: one in each of the two convention center setups, each performing an acoustic set to play the guests into the space and get the party started. Time for a quick conversation to make sure all technical needs have been provided for and everything’s sounding great. 10:30 am – Event production often means rolling up your sleeves and getting your hands into whatever needs to be done, and at the moment, it’s all about rolling out the red carpet — literally — leading to the stage where awards will be handed out in the afternoon. Every detail counts, from ceiling to floor and everywhere in between. 10:45 am – Back on the ground floor, Ilios Lighting is loading in, setting up lighting for the afternoon’s events. In the background, Kennedy Collection elements are being arranged in lounge vignettes so guests can kick back and relax into the afternoon with a cold one amid the sounds of live local music. 10:50 am – A massive thunderstorm has forced a move from the original venue intended for today’s larger ceremony over to the nice, dry convention center, where other components of the event are already being held throughout the week. Kicking the rain plan into gear includes setting up a rustic seating vignette outside the ballroom. Out of frame, huge neon signs are being installed, leading guests into the downstairs awards space and lending an air of Austin warmth to the venue. 11:00 am – A peek into the ballroom concludes that tables have been set up and lights are being strung overhead to lend a more intimate outdoor feel to the afternoon’s festivities. Still on the way are barnyard-themed bar furnishings, including tall cocktail tables made from barrels, and buffet stations serving up local favorites. As start time approaches, house lights will be dimmed for ambiance, and it won’t feel like a convention center at all. 11:45 am – Back to mission control in a breakout room upstairs. Margaret multitasks through lunch, enjoying a bite from the caterers onsite and keeping all the trains running, so to speak, via phone. Behind her are snacks to power the event team and partners through the day: trail mix, pretzels, candy, and of course plenty of water to keep everyone hydrated and energized. 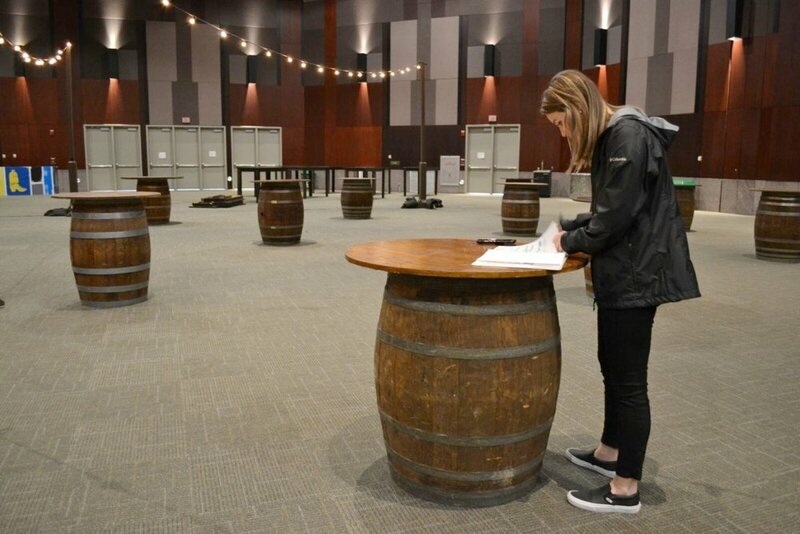 12:40 pm – Standing inside the downstairs event space, Margaret reviews her checklists and the final run of show to make sure every detail’s been taken care of, contingencies are in place as needed, and the client’s every need is being met. Catering will start to set up shop soon, and decor elements will begin to fill the space with a down-home, rustic vibe. 1:00 pm – Back upstairs to mission control, it’s time for a check-in with the team to discuss the final nuts and bolts before guests begin arriving. Weeks of work have led up to this event taking place, and now, it’s down to fine-tuning the second set of day-of details as the well-oiled machine continues rolling. The gears have been in motion for a while, and now it’s all systems go. 2:00 pm – As attendees begin to stream in, Margaret and a member of the client team put their heads together to check in on how everything’s going. A happy client means a happy event producer, and we don’t settle for less. 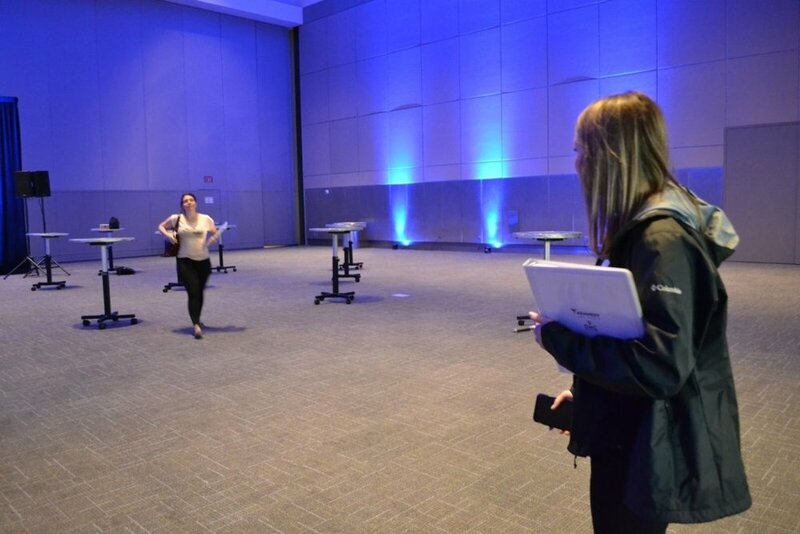 2:15 pm – It’s showtime on both levels of the convention center, and the event team stays in constant contact with one another to run backup if needed. Today, though, things are running smoothly. “Seeing the final product of what you and the team have been working on, having it come to life in front of you, is really rewarding,” Margaret says. 2:30 pm – It’s go time at ground level, and attendees are happily ordering beers and snacking on hors d’oeuvres as they chat with colleagues from around the country. 2:35 pm – As the upstairs attendees gather for some networking and kudos from their leadership, Margaret looks on, keeping an eye on things as they get into full swing. Two and a half days more to go, and then it’s on to the next one, making another client pat themselves on the back for hiring the right planning partner. Want to put us to work for your next big event? Get in touch and let’s put our heads together.